Living in Paris since forever, Lina started her first band as lead singer when she was still in high school. She sang in numerous exuberant parisian bands so far. 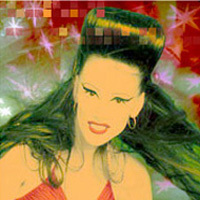 A few years later she met Calvez, a strange bassist, who co-wrote with Arnold Turbout, a famous french composer, her first album "dans cinq minutes j'suis prete" and which was released on East-West and Sony music. 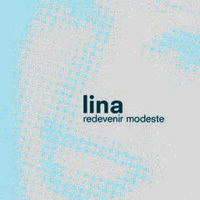 Working with the same team, she released her 2nd album called "redevenir modeste" ("becoming humble again").Lina who likes color and hates to stay quiet is currently running a shop in Paris' flea market in order to statisfy her taste for old, wild and extravagant clothes. jacques, le ...eh...best wine, s'il vous plait". the next 'morning, sitting together in our office, we eat eclairs and read le monde, just to see if our football-boys from paris saint germain were lucky enough to win a game. yes, we know how to enjoy our lives. with "redevenir modeste" lina returns to sing out loud about the everyday life of a french girl: young boys waiting for the chance of a rendez-vous, kisses on cheeks for strangers, fleamarkets near the seine.